Other than Maserati we have quite a few customers in the automotive space that have seized this opportunity and developed apps to serve branded content to their customers and prospects. And why shouldn’t they? Getting on the same page with buyers is the first step to getting them in the door (or driver’s seat, in this case). 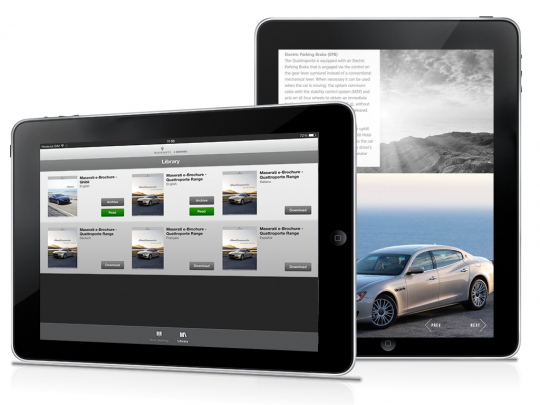 It’s available for iPad and will soon be available on Android and Kindle Fire. The CAR CONFIGURATOR. You can match the different colors and wheel rims according to your taste, transforming the “dress” of the different models and setting a unique style. The browsing of the INTERACTIVE MENU. The beautiful full screen images are combined with a soft browse experience with fade and transparency effects, created with elegance. The DEALER LOCATOR. You can directly access the interactive locator of the maserati.com site thanks to a web-view. The language chosen for the app will automatically parameterize it. The app includes the possibility of creating an interactive CONTACT thanks to the integration with the Maserati registration form. You create a direct connection and gain immediate access to the community.